Tripura CM Biplab Kumar Deb felicitated Padma Shri awardee for this year from the state, Thanga Darlong. Centenarian Darlong, a Rosem (traditional Darlong community flute made of bottle gourd and bamboo) player from Unakoti of Tripura, is among the 94 Padma Shri awardees for this year. 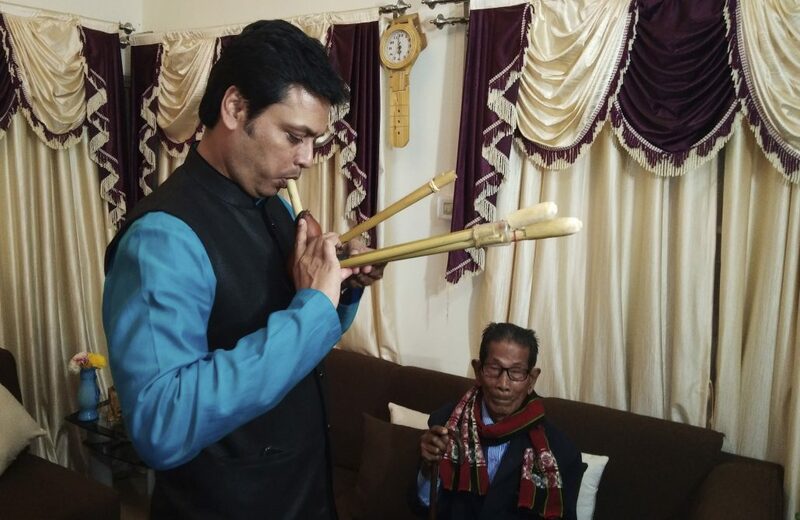 Darlong has been conferred the award in the category of art-music-flute by the Government of India and was felicitated on Monday evening at the chief minister’s residence at Agartala. Privileged to host Padma Shri Thanga Darlong ji at my residence in Agartala today. An amount of Rs 1.5 lakh has been sanctioned from the CM’s relief fund besides Rs 1.2 lakh under PM rural housing scheme for construction of a house for Darlong. The chief minister on hearing from Darlong that he had to take an amount of Rs 40,000 at 10 per cent interest for travelling to get his award and his family could repay only half of the loan amount with interest, the CM immediately went upstairs and paid Rs 20,000 so that he could immediately repay his loan. Darlong thanked the CM and gifted him with a Roshem which Deb tried to play. Born on July 20, 1920 at Muruai village of Tripura, Thanga is considered to be one of the most accomplished performers of Rosem and is dedicated to preserving and promoting the traditional instrument. Earlier, he received the Sangeet Natak Akademi Award for 2014 for his contribution to the folk music of Tripura. Chief minister Deb thanked Prime Minister Narendra Modi and the Union government for choosing a musician from a remote village of Tripura for the Padma Shri award.